Overcast. Slight chance of a rain shower. High 61F. Winds NNW at 5 to 10 mph.. Partly cloudy. Low 42F. Winds SW at 5 to 10 mph. Lebanon's Wyatt Richardson, top, defeated Hunter Eveland of Crescent Valley to win the district title at 126 pounds. Lebanon's Lane Blisseck celebrates his victory in the 182-pound division. Lebanon senior Chase Miller defeated Bryce Miller of Dallas (no relation) to win the district title at 160 pounds. Lebanon's Lane Blisseck defeated Jared Coxen of Dallas to win the district title at 182 pounds. Lebanon's Rian Howard, left, reached the final at 113 pounds before falling to Crescent Valley's Chance Lamer. Lebanon's Keith Brown, right, defeated North Salem's Antonio Garcia to win the district title at 220 pounds. 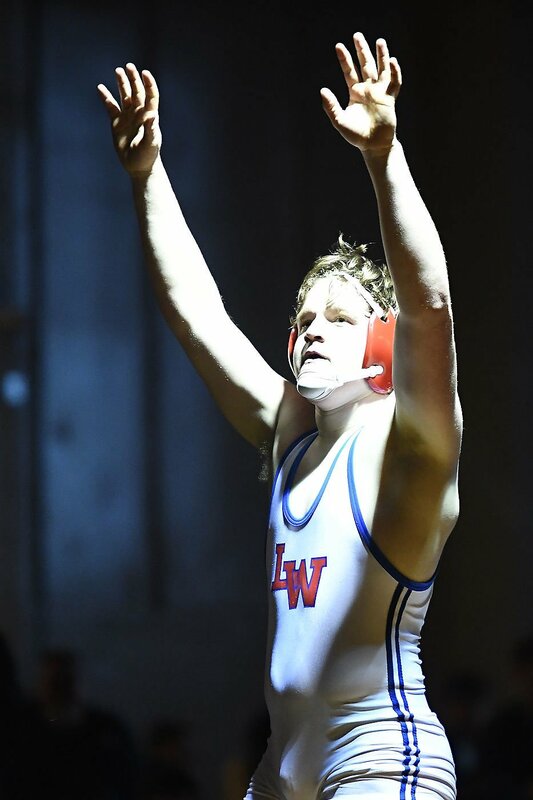 The Lebanon High School varsity wrestling team followed up a successful regular season with a stellar effort at the Mid-Willamette Conference district tournament. The Warriors entered 19 wrestlers at the district event. Eleven of them qualified for the state tournament, led by four Warriors who claimed district championships. Seniors Wyatt Richardson (126 pounds) Chase Miller (160) and Lane Blisseck (182) won their divisions, as did sophomore Keith Brown (220). Lebanon had six wrestlers reach the finals and 15 of the 19 team members placed in the top six in their division. Head coach Michael Cox noted that all three seniors who competed at the district tournament won championships. "We had some really good kids wrestle and compete and that's what we really try to do is peak at the end of the season. That's our goal every year and I think we did that," Cox said. Dallas won the team title as the Dragons amassed 367.5 points. Lebanon was second (296) and Crescent Valley third (259). West Albany (197.5) edged Silverton (190) for fourth while South Albany was seventh (125) and Corvallis ninth (49). The top four placers in each weight class advanced to the state tournament, set for Feb. 22-23 at Memorial Coliseum in Portland. For Miller, the district title was especiallysweet after losing twice in the finals in previous years. "It always feels nice taking home a trophy or a medal, but without my teammates and all my coaches pushing me, I don't think I'd be here," Miller said. Brown avenged two earlier losses to North Salem’s Antonio Garcia, earning a hard-fought 5-3 victory at 220. Brown took a 2-0 lead after the first period and led 3-1 when he took a shot to the face. He regrouped and took a 5-1 lead before fending Garcia off late for the win. Richardson gave the Warriors their second individual title with a 6-1 victory over CV’s Hunter Eveland at 126. Richardson, who was third last season at 120, took a 4-1 lead after one quarter and never allowed Eveland to catch up. He said the end of his sophomore season was a turning point in his career and his motivation to win a district title changed. “I knew I had the potential but I didn’t quite have the work ethic so I put my mind to it,” he said. Lebanon’s Lane Blisseck had a back-and-forth battle at 182, but took home back-to-back district titles with an 11-7 win over Dallas’ Jared Coxen. It was the fifth time the two had squared off this season, with Blisseck winning three of the previous four. Coxen had won the last match before the district meet, which was decisive in giving him the top seed. Blisseck had a 4-1 lead after the first period but fell behind 6-5 before leading 8-6 after two. He was able to put the match away in the third. Austin Dalton came up short at 132 pounds as the Lebanon sophomore dropped a 13-4 major decision to Dallas’ Joseph Foster. Cox gave the team Monday off following the meet, but expected the squad to work hard the rest of the week, with at least a couple of two-a-day sessions. Next week the work load will lighten up as the team prepares for state. Steve Gress of the Corvallis Gazette-Times contributed to this story.